Interviews by Tim Flanagan & Michael Fedison. 8:00 a.m. Update: I hit 5,000 followers this morning. Thank you! I love achieving these milestones with you all. They make my day! This blog brings me plenty of joy. Discussing writings and readings with you all is often my favorite part of the day. It’s my passion, and to be able to do something with it on a daily basis is a joy. 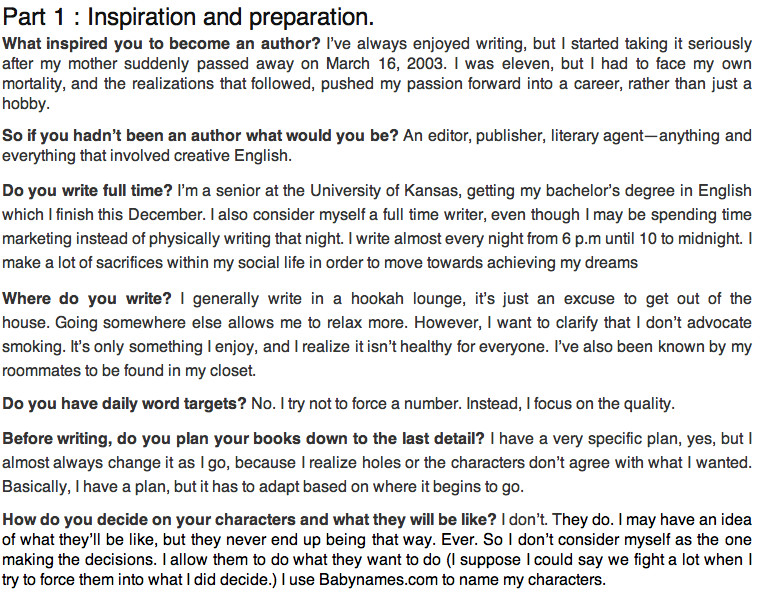 I love to use my Author Page for daily updates. Click here to join & don’t forget to send me a message. I’ll like your page too! On many occasions, because of my Contact page, I receive emails from very enthusiastic followers–talented writers and readers who, sometimes, just want to discuss the industry, (or something else entirely), and we have a great time talking about EVERYTHING. Seriously. I can talk forever. I have days when I can’t email right away. (I’m busy with school most of the time.) But I try my best, and I have daily emailers who brighten my day with their messages. I wanted to share two of them with you all: Tim Flanagan & Michael Fedison. Tim Flanagan: Author of The Moon Stealers, Flanagan is inspired by the liberation writing brings, while loving his family along the way. His blog can be found by clicking his name, and his Author Facebook page is here. When he interviewed me, I was excited about how thorough his questions are and his ability to adjust to my answers by asking additional questions to enhance the meaning. He has numerous parts of the interview coming, but Part I: Inspiration and Preparation can be found here. His questions include, but aren’t limited to, What inspired you to become an author, Do you have daily word targets, Before writing do you plan your books down to the last detail, How do you decide on your characters and what they will be like? 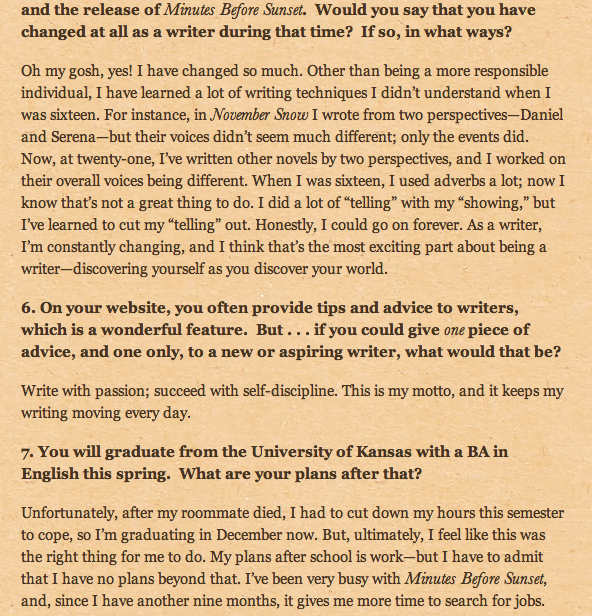 I think these are great questions, and if you’re looking for more writing tips, this interview is a great place to go to, because Flanagan really asked about what I do in my writing process. Here’s a piece of his interview. Michael Fedison: Author of the Eye-Dancers, uses his first 25 years of life in western New York and creates an extraordinary journey with four kids who are about to realize that everything is connected. Two days ago, however, he posted the interview he did on me, and you can read what he asked here. This is a piece of Fedison’s interview about me. There’s some really great information on both of these interviews that my website doesn’t have yet. Hint: Minutes Before Sunset. And there’s even more great information on these authors and what they’re currently up to. I think they are great (and inspiring) men to follow! After all, following them is how we came into contact, and I couldn’t be more grateful for their lovely support. If you’re wanting to take another aspect away from this post, take this: Interviews and reviews are a great way to support writers you appreciate, and it means so much to see such physical results for all the hard work you’ve done. So–interview (or review) someone you love this week. Feel great about it too, because, for all you know, they will remember your wonderful deed, and they will post something about you in return. I like Shannon’s idea about reviewing some of the bloggers we meet! Congrats on 5000 followers! You’re officially a celebrity…or maybe you’ve already been officially a celebrity! Thanks for the link and comments Shannon – you are an inspiring author to all young writers (and middle aged ones like me!!!) Keep up the good work, stay focused and enjoy the adventure of writing – it’s the best thing in the world. It is! Thank you again. I appreciate everything. Thanks so much for stopping by my blog! I can tell I’m going to like yours. Congrats on the new book coming out!